When 21-year-old Godfrey Cutto hopped on the bus on a normal afternoon, something happened that he didn’t know how to respond to at first. Godfrey was headed home after grabbing a bite to eat. As he made his way to an empty seat, a man asked to shake his hand. Though he was surprised, Godfrey obliged… but the man kept holding on. “He kept holding my hand,” Godfrey said. 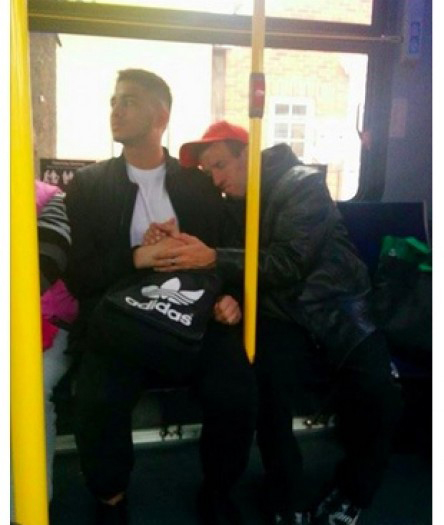 “I thought I was getting pranked at first, but he just needed comfort.” It turns out the man was named Robert and he had special needs. Robert held tight throughout the bus ride, hugging and leaning on Godfrey like they were best of friends. Someone snapped a photo and it went viral on Facebook. Soon, a family member of the man with special needs saw it and contacted Godfrey to thank him for the kind gesture. The family member explained that Robert sufferers from cerebral palsy and deafness in addition to his special needs. He also said Robert was likely afraid of the unfamiliar setting and simply needed someone to comfort him. Godfrey stayed on the bus with his new friend Robert until the last stop. His gesture is kind and selfless… and we can all learn from it. Share this today and challenge yourself to never pass up the chance to help someone in need. The smallest gesture can change a life. Heartbreaking Story of A Park Ranger Comforting A Sad Gorilla. Find Out Why!